It is about amateur's realization which, at first (1990), consisted in making a prototype to test the possibility to build a SHG. The presence of a microcomputer at home as well as a linear CCD, and especially the recovery of a grating, allowed this starting up. Thus the budget should be minimum and the "D.I.Y. system" largely used. 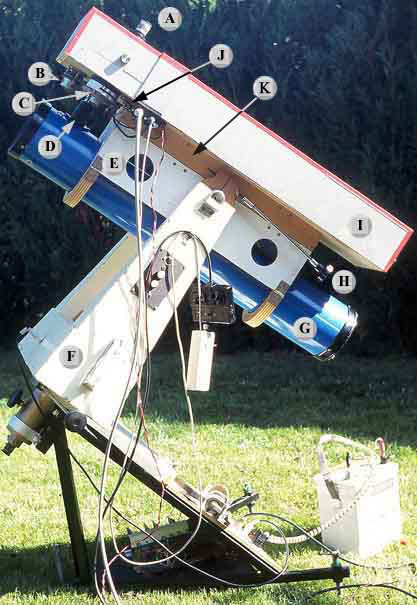 The constraints were severe because the first version of the SHG should be in "piggy-back" on a classic 115/900 telescope supported by the most classic and frail equatorial mounting on a wooden tripod. Useless to specify that the weight and the dimensions of the spectro should be minimum too ! If 1 pixel of the CCD is about 10µm wide (perpendicular direction to the axis of the bar), it is necessary that the dispersion of the spectrum is such as this 10µm intercepts a spectral band of 0,05 nm (We will say that the dispersion is 5 nm / mm). This dispersion is a function of 3 elements: The number of lines by mm of the grating, the order of the grating, and the focal length of the camera lens (the one that forms the image of the spectrum). Dispersion increases if these parameters increase. Dispersion is not all, it is also necessary to take account spectral resolution. Nothing serves for having a strong dispersion if the resolution is not good. The problem is the same one as a telescope. Let us suppose an objective of 1,2 m focal length and 100 mm in diameter, good quality. This objective is able to give at focus plane an image of the Moon of 10mm in diameter. If we reduce to 20 mm the aperture of the objective by means of a diaphragm, the image of the Moon measures always 10 mm in diameter but the resolution of details is 5 times less good. For a spectral resolution in connection with the dispersion, it is needed a wide enough grating. The elements which I had were the following ones: a linear CCD Thomson TH7803 made up of 1728 photodiodes of 10x13µm in the step of 10 µm, a plane reflection grating 1180 grooves per mm and 62 mm aside. With regard to the spectral resolution, R=73000, one reaches in theory 0,01 nm in the first order so, no problem. The angle of diffraction for Ha line is 22 ° 48 ' and to cover 13 µm with a spectral band of 0,05 nm, a 200 mm focal length camera is sufficient - in theory !. It is there about a minimum value. But if one wants to focus all the light from the grating, it is necessary to find an objective of 62 x square-root( 2 ) - is 87 mm - in diameter with a F/D = 2,2. Let us say at once that in practice, it is widely better to largely raise the focal length, on one hand to minimize aberration of sphericity of the objective, and on the other hand to minimize aberrations of the assembly monochromator of which we shall speak again, and finally to minimize budgetary expenditure. Obtaining of a 17 mm solar image requires an objective of almost 2 m focal length. 1 pixel (10 µm) represents then a little more than 1 arc-second. An objective of 12 cm in diameter can - always in theory - allow this resolution but let us not forget that we observe the Sun and that the turbulence is generally limiting. One will thus gain nothing in resolution by using a larger objective. It is now necessary to consider the digital aspect of the image. 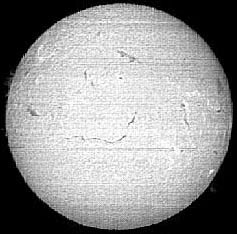 By using to the maximum linear CCD (1700 pixels) and to synthetize a circular image, it will be necessary "to cut the Sun" in 17000/13 = 1307 successive sections. This represents 1700x1300 = 2,2 million pixels and, even digitized in 256 levels of grey (8 bits), it represents more than 2 MB of memory. In 1990, microcomputers capable of treating this kind of image were still extremely expensive. I had then an ATARI 1040 without hard disk and allowing to display 320*200 pixels images with only 16 colours. The first limitation was the support of recording: 720 KB floppy disk; the second was the impossibility to display "big" images. I thus decided to limit the size of the images to 640x400 pixels by making the reading of 640 lines of 800 pixels and by taking only one pixel out of two in each line. These elements led me to use the focal image of 8 mm supplied by the telescope 115/900 and to acquire 2 spherical mirrors 76/700 to make the monochromateur. Ratios F/D are close and grating is practically totally enlightened. The figure opposite shows an example of image in Hα light obtained with this preliminary assembly. Filaments, plages, prominences are visible. Spectral resolution is that expected but spatial resolution is not very good because all the adjustements are manual and very delicate to realize without making vibrate the instrument. After this first experiment and an unproductive period of a few years, I consider again the construction of a SHG because certain favorable circumstances were gathered. I built an equatorial mounting motorized in right ascension and in declination for my 115/900 telescope. Intended originally for the photography of the deep sky with a 500 mm telephoto lens in parallel with 115/900, the stability, robustness and convenience are without comparison with the first mounting. The recovery of a new grating - although far from the new state - blazed 500 nm and 1440 grooves per mm, the diversion of an other linear CCD from a hand-scanner and the purchase of a microcomputer revived my interest for SHG. Here is the description of this instrument that is however only an example and each can modify and improve it. As a drawing is better that 10000 words, here is the plan of the arrangement of the optical components constituting the SHG. Telescope is in the bottom. This picture will remind the location of the elements detailed in the other pages (corresponding element will be darkened).